This weeks post workout meal was a completely new recipe for me so it was a bit of a risk to cook and document it for the blog at the first attempt, the fact is it sounded so interesting that I just had to give it a try. 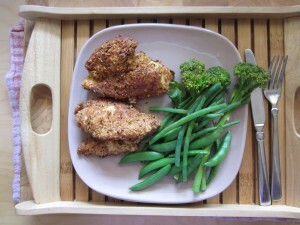 The star of the show is coconut & chili coated fried chicken, with a generous portion of steamed green veg on the side. 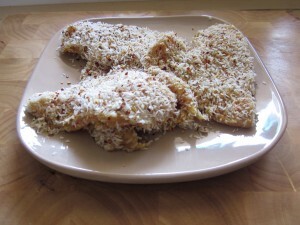 The technique involves a three step process to get from raw chicken breast fillets to fillets generously coated with chilli and coconut. Firstly whisk two eggs in a bowl. Prepare the first coating by combining coconut flour, salt and the three dried spices in another bowl – ensure that there are no lumps in the flour and the spices are evenly mixed. On a shallow plate, combine dessicated coconut & chili flakes. Pat down the fillets with some kitchen roll to remove any excess moisture. 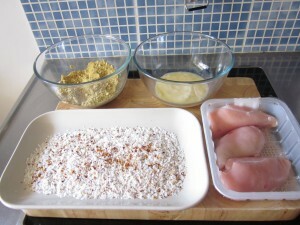 Take the first fillet and place it in the bowl of coconut flour and spices and ensure it is completely covered in the mixture, then shake off any excess flour. Transfer to the egg mixture and again make sure the fillet is completely coated in egg. Finally place the fillet on the shallow plate of dessicated coconut and chilli and ensure the fillet is coated in the mixture. Place the fillet on a plate and repeat the same process for the remaining fillets. Next preheat your oven to 180ºC (350ºF). To cook the fillets heat some coconut oil in a frying pan, aim to have about half an inch or so of oil so the amount you use will depend on the size of your pan. 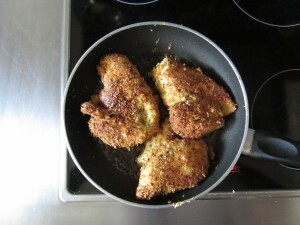 Place the fillets in the pan and fry until golden brown on each side, this will probably take around 5 minutes per side on a medium heat but keep checking to ensure they don’t burn. Once the chicken has finished frying transfer it to an ovenproof tray or dish and cook in the oven for 20 minutes – always cut into the thickest part of the fillet to ensure it is cooked properly, if not put back in the oven for 5 minutes and check again. Whilst the chicken is cooking in the oven lightly steam a selection of your favourite vegetables, I used broccoli, sugar snap peas & green beans. Please leave any comments below, especially if you have any suggestions on how to improve this recipe, maybe you can recommend different spices or something extra in the coating to add a different flavour? That looks awesome dude, I will give that a blast.